The first activation of a multi-user license defines the person who will become the License Administrator for the software. First activation of a multi-user license. The activation password that is entered will be used to activate all further seats associated with this license code and the email address entered will be that of the License Administrator who will be able to monitor license use via the License Control Panel. Note Activation of the first copy of GraFit will use up one of the available license seats. If the License Administrator is not a regular GraFit user (for example, in a large corporation this could be an IT professional) then it is possible to regain use of the seat by deactivating this user installation via the License Control Panel. Deactivating an individual user in the License Control Panel will not remove their registration as the License Administrator. After the initial activation, the License Administrator will receive an email (with the subject "License Control Panel Information") telling them how to create an online account that allows them to monitor license use. Our multi-user licensing is implemented using software produced by a company called softWORKZ, who provide the online licensing servers. This email will remind you of the multi-user activation code that has been used and provide a Confirmation Key that will let you add this code to your personal License Control Panel account. A single account can monitor any number of difference activation codes, allowing one or more GraFit licenses to be regulated by a common administrator if required. Note Most email systems are set up to move unsolicited email to a "Junk" email folder. In the event that you cannot find your License Control Panel Information email, try looking in your Junk folder in case it has been moved there. Follow the instructions to create your account. Once created you can then log in to your personal account. Additional users, up to the maximum specified by the license, are added in the same way as the initial user. 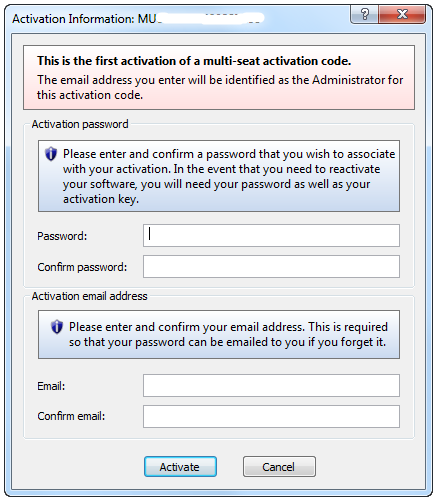 The GraFit software must be installed on the userï¿½s computer and then when the software is run, the multi-user license code is entered into the activation information dialog box. For subsequent users this will produce the following dialog box. 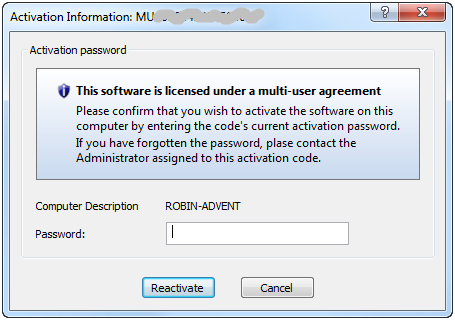 Subsequent activation of a multi-user license. 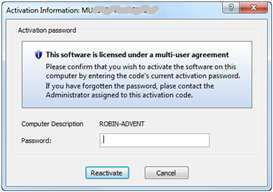 Activation of the software will need the password that was specified during the first activation and which is available from the License Administrator who first activated the software. The seats in a multi-user license can be re-allocated to other users by deactivating one or more of the installed seats. Deactivation can either be performed by the License Administrator from the License Control Panel, or by the using the Deactivate button that is found on the Help About dialog box. Note Deactivation of a seat will typically take 24 hours to process. You will therefore not be able to add a new user seat until this time has elapsed.